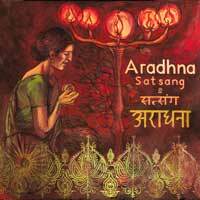 My Aradhna (Satsang) CD finally arrived. Let me complain a little here. Apart from making me BUY it (how rude – i normally receive CD’s free) it took far too long to arrive (its a belated Christmas present) the recording is poor, there is no meta-data for iTunes, their online shop did not recognise the United Kingdom and the actual recording is based on a mishap. Apparently, they were recording the final night of a tour for a CD and a 3 year old child kicked the cords and they lost everything. But they felt God wanted them to continue so they played to those in the crowd that wanted to stay . . thus . . this album called Satsang. Having said that. The CD is absolutely incredible and curry nights at our house will never be the same. I also think you should buy it. In fact, if your music collection of worship songs does not include at least ONE Aradhna CD, then it is indeed one tuna casserole short of the potluck. I took this picture at Greenbelt Festival last summer. The other bands were raving about Aradhna and I had to hear them for myself. Mike of RiverTribe, who has blogged about Aradhna, was the guy who told me to see them. Since then, other friends in my world have told me about Aradhna coming through their town (Barb in Lisbon, Linda B. in San Francisco) Jonny Baker had also mentioned them. Anyway – a great band with a great missiological philosophy on why indigenous patterns of local worship are so important to God who does not want the whole wide world to be Maranathaized or Hillsonged out of recognition. We got our Aradhna CD at Greenbelt. Brilliant for an ambient background. It’s a pity their work is not generally available in the UK. saw some of these guys at greenbelt as well. tis indeed a shame that their material is not so widely available in the uk. i see they played a few other dates in the uk last year. wonder if there are any more on the horizon…??? oops! correction….chris and pete (aradhna) were with us in oct 2003! it was rivertribe that was with us in 2004! lisa – i think i was with you in oct 2004, also, wasnt i? rivertribe were there at our retreat north of Lisbon. yeah, that’s right! i didn’t get to meet you but byron went up to that retreat with barbara and jasmin and mike and co. mike keeps making noises about getting back here some time. we hope so! This is one big Portugese love-in isn’t it? (Hi Lisa, we miss you lots) Truth was, we in Rivertribe piked out of our street gig in Lisbon after being spooked by almost getting beaten up in Munich, but we went on to do some great club gigs (and almost got arrested for playing outside the office of the Minister for Police in downtown Lisbon) and we met Andrew Jones there. not a bad sort of chap! Anyway, this is about Aradhna-they were a tough act to follow…they graciously came to our gig at Greenbelt, but their gigs knocked me flat. My biggest regret is I forgot to buy Satsang while I weas there. I can’t order there discs here in Oz but i do log into their site where you can listen to their songs and even download the chord charts. Thanks so much for the tip! My Satsang CD arrived and I love it! Just wrote a short piece about it even! Thanks again. A bit late on this, but I did want to thank you for pointing out these guys. We played a few of the tracks before out Sunday services this week. Really, really nice.